Pre-orders have opened for the tri. 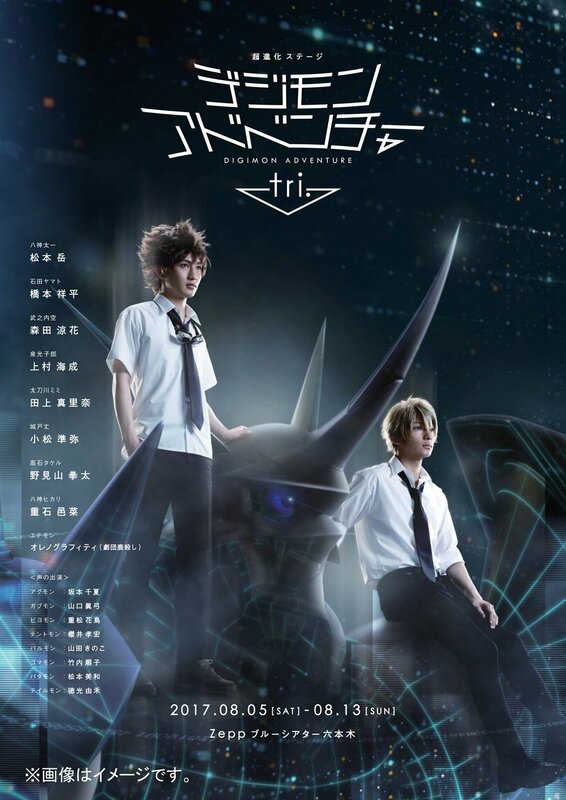 Stage Play DVD, plus we have some details! We don't have a lot of info yet, just a few basic things, some of which we knew previously. The DVD will be released on December 2nd and cost 9,504 yen. As previously announced there is no Blu-ray release. The release is listed as two DVDs. We don't currently know 'why' it's a two DVD release yet: whether they are including two showings of the stage play, splitting it at the intermission between discs, or including bonus content on a second disc. CDJapan affiliate link for the normal version, Amazon link for the Amazon version. Why are they on the wrong shoulders, anyway? Finally a public announcement... I wonder if the DVD you could preorder at the actual event is the same product or something special. The shoulders were probably simply not important enough to completely reframe the poster for. If they had the actors switch places Taichi would shift into the background and that wouldn't work because he is the more prominent character. Also, if they did the same kind of angle from the other side (even ignoring the general framing and composition issues that would cause), the shield on the shoulder would really get in the way. That one spike from the MetalGarurumon shoulder already sticks out very prominently, the shield would awkwardly block half of Taichi from view. Added a CDJapan affiliate link for the normal version of the DVD. From what I recall (I went twice, my friend went three times), they're using the final showing (NicoNico) as the dvd version, which is pretty common (final showing seems to have more intense fans, is hopefully the most polished session, staff are more on the ball and emotional to see it end, longer messages by the actors, etc etc).